THE FIJI regime and some of the Suva media have had a field day this week ... castigating Fairfax Media's international journo who covers Pacific issues - Michael Field. 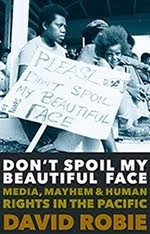 The fallout came after the regime's Ministry of (dis)Info gleefully jumped the gun and circulated a media release noting that a complaint against Field had been upheld by NZ's Broadcasting Standards Authority over his views about Fiji expressed in Radio NZ National's Nine to Noon programme on 7 March 2008. 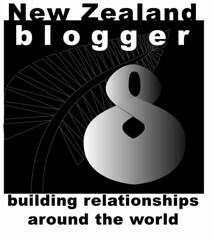 The BSA didn't uphold a complaint by Fiji Solicitor-General Christopher Pryde against Radio NZ Ltd under principle 4 (balance), but it did uphold the complaint under principle 6 (accuracy). It ruled that four inaccurate statements had been made during Field's discussion of how Fiji was reeling from "all the signs of true military dictatorship". Complaints committee chair Joanne Morris didn't impose any order. She said publication of the ruling would "serve as a reminder to commentators that they must ensure the accuracy of factual statements". Many of the local media in Fiji were quick to seize on the regime handout about the adjudication. 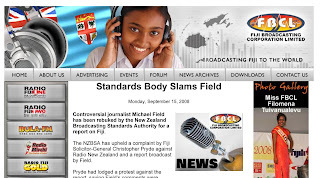 Radio Fiji summed it up by saying "controversial journalist Michael Field has been rebuked by the BSA ..." Fiji Daily Post ran an article by Fiji Human Rights Commission director Dr Shaista Shameem, claiming - unfairly - Michael Field "'wings' it when he can" in an article under the headline "The writing on the wall". Even NZPA circulated a piece that largely echoed the Fiji government line that was also run on Field's own media organisation's Stuff website. Kiwiblog highlighted the actual inaccurate statements and sparked a handful of responses, one posting noting that the Fiji regime should be recognised as the "nearest thing there is to a benign military junta". Field himself, according to an email to Pacific Media Watch, regards the reporting "shallow" and the adjudication itself as "interesting". Bruce Hill also gave the issue an airing on Radio Australia's On The Mat. Meanwhile, in other blood-letting about the Fiji media and politics, former Fiji Daily Post publisher Thakur Ranjit Singh has been riled by Kamal Iyer's one-sided monologues in the Fiji Times about life under the regime. 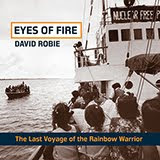 He has written an alternative view of balance and fairness. Singh also takes a potshot at conflicts of interest in the Fiji media.